What are the signs and symptoms of Graves' disease? Is Graves' disease a problem during pregnancy? Who gets Graves' disease? Is it common? What tests diagnose Graves' disease? What is the treatment for Graves' disease? Can this form of autoimmune thyroid disease be cured? What serious health problems are caused by untreated Graves' disease? Is it fatal? Graves' disease is an autoimmune disease of the thyroid that results from abnormal stimulation of the thyroid gland by a material in the blood referred to as thyroid stimulating immunoglobins (TSIs) that bind to and activate thyrotropin receptors. Graves' disease is the most common cause of hyperthyroidism in the U.S.
reddening and thickening of the skin on the shins and top of the feet (pretibial myxedema or thyroid dermopathy). The cause of Graves' disease is thought to be related to many factors including genes, gender, stress, pregnancy, and possibly infections. Graves' disease affects both men and women; however, the autoimmune thyroid disease affects women about eight to 10 times more often than men. Risk factors for Graves' disease are associated with other autoimmune diseases such as vitiligo, rheumatoid arthritis, Addison's disease, type 1 diabetes, pernicious anemia, and lupus. Tests to diagnose Graves' disease include thyroid function tests, radioactive iodine uptake tests, and tests to detect TSIs. Treatments for Graves' disease include radioactive iodine, antithyroid drugs such as methimazole (Tapazole) and propylthiouracil (PTU), and beta blockers; in some patients, surgery is done. Untreated Graves' disease can lead to thyrotoxicosis and its severe form, thyroid storm, a life-threatening condition that causes heart problems, weak and brittle bones, and death. Poorly treated Graves' disease during pregnancy can cause problems for the woman such as preterm birth, miscarriage, heart failure, preeclampsia, and placental abruption. Poorly treated Graves' disease can cause health problems for a fetus or baby such as preterm birth, low birth weight, thyroid problems, and still birth. Hyperthyroidism or overactive thyroid, is a condition in which an excessive amount of thyroid hormones are produced by the thyroid gland. A common cause of hyperthyroidism is Graves' disease, another type of thyroid problem that cannot be cured. 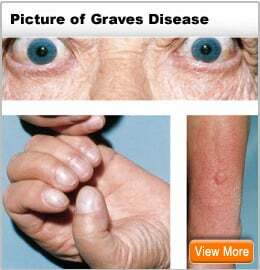 If Graves' disease is not treated you can die. (It is fatal.) Graves' disease and hyperthyroidism share similar symptoms like unexplained weight loss, trembling hands, heat intolerance, irritability, and frequent bowel movements. 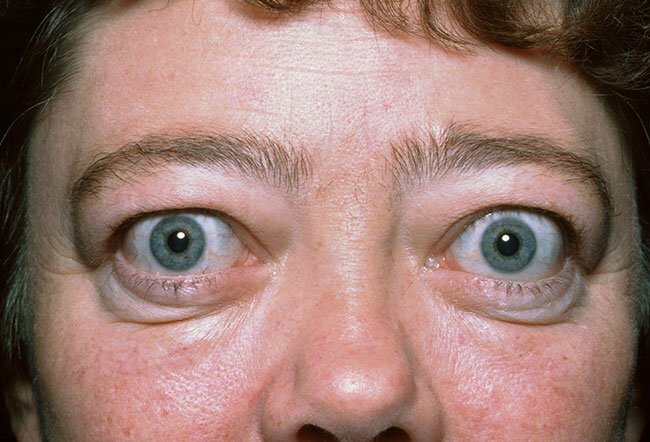 What is Graves' disease? What does it look like (pictures)? Graves' disease is an autoimmune disorder that causes hyperthyroidism, or overactive thyroid. With this disease, your immune system attacks the thyroid and causes it to make more thyroid hormone than your body needs. The thyroid is a small, butterfly-shaped gland in the front of your neck. Thyroid hormones control how your body uses energy, so they affect nearly every organ in your body - even the way your heart beats. If left untreated, hyperthyroidism can cause serious problems with the heart, bones, muscles, menstrual cycle, and fertility. During pregnancy, untreated hyperthyroidism can lead to health problems for the mother and baby. Graves' disease also can affect your eyes and skin. Rarely, people with Graves' disease develop a reddish thickening of the skin on the shins, a condition called pretibial myxedema or Graves' dermopathy. This skin problem is usually painless and mild, but it can be painful for some. Graves' ophthalmopathy (Graves' orbitopathy) can cause retracted eyelids, meaning the eyelids are pulled back from the eye. Graves' orbitopathy can also cause bulging eyes, double vision, and swelling around the eyes. Researchers aren't sure why some people develop autoimmune disorders such as Graves' disease. These disorders probably develop from a combination of genes and an outside trigger, such as a virus. With Graves' disease, the immune system makes an antibody called thyroid-stimulating immunoglobulin (TSI) that attaches to thyroid cells. TSI acts like thyroid-stimulating hormone (TSH), a hormone made in the pituitary gland that tells the thyroid how much thyroid hormone to make. TSI causes the thyroid to make too much thyroid hormone. Thyroid hormone levels that are just a little high are usually not a problem in pregnancy. However, more severe hyperthyroidism that isn't treated can affect both the mother and the baby. If you have Graves' disease, be sure your hyperthyroidism is under control before becoming pregnant. Graves' disease is the most common cause of hyperthyroidism in the United States. The disease affects about 1 in 200 people. Graves' disease usually affects people between ages 30 and 50, but can occur at any age. The disease is seven to eight times more common in women than men.3 A person’s chance of developing Graves’ disease increases if other family members have the disease. Your health care provider may suspect Graves' disease based on your symptoms and findings during a physical exam. One or more blood tests can confirm that you have hyperthyroidism and may point to Graves' disease as the cause. If the diagnosis is uncertain, your doctor may order further blood or imaging tests to confirm Graves' disease as the cause. A blood test can detect TSI. However, in mild cases of Graves' disease, TSI may not show up in your blood. The next step may be one of two imaging tests that use small, safe doses of radioactive iodine. Your thyroid collects iodine from your bloodstream and uses it to make thyroid hormones; it will collect radioactive iodine in the same way. Radioactive iodine uptake test. This test measures the amount of iodine the thyroid collects from the bloodstream. If your thyroid collects large amounts of iodine, you may have Graves' disease. Thyroid scan. This scan shows how and where iodine is distributed in the thyroid. With Graves' disease, the entire thyroid is involved, so the iodine shows up throughout the gland. With other causes of hyperthyroidism such as nodules - small lumps in the gland - the iodine shows up in a different pattern. People with Graves' disease may be sensitive to harmful side effects from iodine. Eating foods that have large amounts of iodine - such as kelp, dulse, or other kinds of seaweed - may cause or worsen hyperthyroidism. Taking iodine supplements can have the same effect. Talk with your health care professional about what foods you should limit or avoid, and let him or her know if you take iodine supplements. Also, share information about any cough syrups or multivitamins that you take because they may contain iodine. What is the treatment for Graves' disease? Can it be cured? You have three treatment options: medicine, radioiodine therapy, and thyroid surgery. Radioiodine therapy is the most common treatment for Graves' disease in the United States, but doctors are beginning to use medicine more often than in the past. Based on factors such as your age, whether you are pregnant, or whether you have other medical conditions, your doctor may recommend a specific treatment and can help you decide which one is right for you. For radioiodine therapy, you take radioactive iodine-131 (I-131) by mouth as a capsule or liquid. I-131, at a higher dose than the dose used for imaging tests, slowly destroys the cells of the thyroid gland that produce thyroid hormone. The dose of I-131 usually used for radioiodine therapy does not affect other body tissues. You take radioactive iodine-131 as a capsule or liquid. Although it's unlikely, you may need more than one radio-iodine treatment to bring your thyroid hormone levels into the normal range. In the meantime, treatment with medicines called beta blockers can control your symptoms. Almost everyone who has radioactive iodine treatment later develops hypothyroidism, or underactive thyroid, because the thyroid hormone-producing cells have been destroyed. However, hypothyroidism is easier to treat and causes fewer long-term health problems than hyperthyroidism. People with hypothyroidism can completely control the condition with daily thyroid hormone medicine. Doctors don't use radioiodine therapy to treat pregnant women or women who are breastfeeding. Radioactive iodine can harm the fetus' thyroid and can be passed from mother to child in breast milk. Beta blockers don’t stop your thyroid from producing thyroid hormone but can reduce symptoms until other treatments take effect. These medicines act quickly to relieve many of the symptoms of hyperthyroidism, such as trembling, rapid heartbeat, and nervousness. Most people feel better within hours of taking beta blockers. Antithyroid therapy is the simplest way to treat hyperthyroidism. Antithyroid medicines cause your thyroid to make less thyroid hormone. These medicines usually don’t provide a permanent cure, but in some people, the effects last a long time after they stop taking the medicine. Doctors most often use the antithyroid medicine methimazole. Doctors usually treat pregnant and breastfeeding women with antithyroid medicine, since this treatment may be safer for the baby than other treatments. Doctors use propylthiouracil more often than methimazole during the first 3 months of pregnancy because methimazole may harm the fetus, although this happens rarely. Also rarely, propylthiouracil may affect the fetus, but any effects are less harmful than having uncontrolled hyperthyroidism during pregnancy. Once treatment with antithyroid medicine begins, your thyroid hormone levels may not move into the normal range for several weeks or months. The total average treatment time is about 12 to 18 months, but treatment can continue for many years in people who don’t want radioiodine or surgery to treat their Graves' disease. The least-used treatment for Graves' disease is surgery to remove the thyroid gland. Sometimes doctors use surgery to treat people with large goiters, or pregnant women who are allergic to or have side effects from antithyroid medicines. Before surgery, your doctor will prescribe antithyroid medicines to bring your thyroid hormone levels into the normal range. This treatment prevents a condition called thyroid storm - a sudden, severe worsening of symptoms - that can occur when people with hyperthyroidism have general anesthesia. After surgery to remove your thyroid, you will develop hypothyroidism and need to take thyroid hormone medicine every day for life. After surgery, your doctor will continue to check your thyroid hormone levels and adjust your dose as needed. Serious health problems (death) caused by untreated Graves' disease? NIH; NIDDK. Graves' Disease. Updated Sep 2017. How is rheumatoid arthritis different from other forms of arthritis, such as osteoarthritis and gout? Take the Rheumatoid Arthritis (RA) Quiz to rest your RA IQ. Tremor is the involuntary movements of one or more parts of the body. Causes of tremor include neurological disorders, neurodegenerative diseases, drugs, mercury poisoning, overactive thyroid and liver failure. There are several types of tremor. Treatment depends upon the type of tremor and availability of medications for the condition.